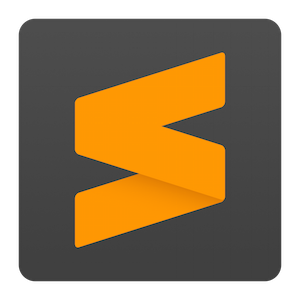 Sublime Text is a sophisticated text editor for code, marking and prose. You will love the elegant user interface, extraordinary features and incredible performance. • Improved overall High DPI support. • Added support for 8k monitors and 300% DPI scale. • Themes can now provide @3x versions of images for very high DPI monitors. • Improved indent guide positions when using line padding. • Rulers are drawn with stippled lines. • Fixed occasional yellow or black windows when using a theme with a colored title bar. • Double-clicking a themed title bar now performs the default system action. • Fixed sizing of some dialog windows when a theme uses a themed title bar. • Fixed gutter icons sometimes not drawing. • Added ligature support for symbols. • Added font_options for controlling ligatures and stylistic sets. • Improved rendering and selection of emojis. • Tab width is now properly measured for proportional fonts. • Added Goto References when hovering over a symbol. • Added goto_reference command to the Goto menu. • Added new color scheme format, .sublime-color-scheme. • Add Hashed Syntax Highlighting. • Added the Celeste color scheme to showcase hashed syntax highlighting. • Selections now render by default with true rounded corners. • Added color scheme settings for selection border width, corner style and radius. • Selection background and border now support alpha channels. • Improved color scheme reloading. • Added Convert Color Scheme command. • Added support for the invisibles key in color schemes. • • selection_foreground can now be specified on a per-scope basis. • Color Schemes can specify bold and italic in the brackets_options key. • Improved handling of invalid.deprecated scopes in default color schemes. • Add embed action to .sublime-syntax files for improved syntax nesting. • Added Git Formats package for Git config files and use as core.editor, with thanks to Ryan Boehning and deathaxe. • ShellScript, with thanks to Raoul Wols. • Makefiles, with thanks to Raoul Wols. • Java, with thanks to lastsecondsave. • C#, with thanks to keith-hall. • Markdown, with thanks to keith-hall. • Python, with thanks to FichteFoll. • Added stand alone syntax test runner for Linux, allowing for CI testing. • Various syntax definition errors now include the file name in the message. • New Command Palette implementation that can accept text input from users. • Fuzzy matching can match terms out of order by space separating them. • Added new commands Arithmetic, Rename File and View Package File to showcase new features. • Keyboard shortcut hints are no longer cut off at 15 characters. • Use /usr/bin/env to locate bash. • Fix multi-byte encodings sometimes triggering decoding errors. • Improved exec build target handling of killing child processes. • Improved handling of symlinks in the sidebar, including additions and removals. • Symlinks no longer have an expand arrow in the sidebar, but have a Reveal Link Source context menu entry. 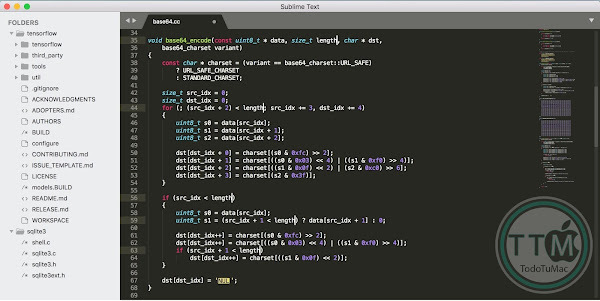 • Add support for binary_file_patterns, index_exclude_patterns and index_include_patterns to .sublime-project files. • index_exclude_patterns and index_include_patterns can now match full paths instead of just filename. • Reduced the number of file stats operations. • Added support for case-sensitive file systems. • Fixed popup and auto complete windows not showing when the caret is at the leftmost position of a widget. • Fix left arrow not working in the side bar. • Fixed not being able to grab the scrollbar by clicking on the rightmost pixels of the window. • Fix double clicking on the selection not setting input focus when drag_drop is enabled. • Significantly reduced memory usage related to syntax definitions - using up to 30% less total program memory. • Improve idle CPU usage. • Fix a bug where theme animations may continue even after a layer has been hidden, causing excessive CPU usage. • Solved increased CPU usage on Macs when a GPU switch occurs while using a theme with a colored title bar. • Added TextInputHandler and ListInputHandler to interact with new Command Palette functionality. • Added View.style() and View.style_for_scope(). • Added automatically generated scope names for use with the regions API: region.redish, region.orangish, region.yellowish, region.greenish, region.bluish, region.purplish and region.pinkish. • Improve View.find() and View.find_all() performance when doing literal matches. • Fix EventListener.on_activated_async() not being called for views when the editor starts. • Add ViewEventListener.on_activated() and ViewEventListener.on_activated_async() to be called for views when the editor starts. 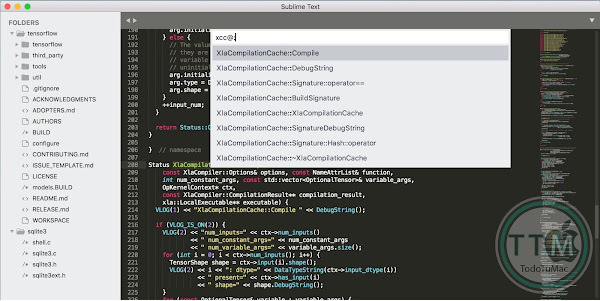 • Improve tracebacks for Python in .sublime-package files. • shell_environment is now ensured to be loaded before plugin_loaded() is called on plugins. • Plugin commands are now created before plugin_loaded() is run. • Loaded plugins are now stored in __plugins__ rather than plugins. • The Python ssl module will now negotiate TLS 1.2, 1.1 or 1.0 with the PROTOCOL_TLSv1 constant. • Updated Python environment with SQLite 3.22.0, and OpenSSL 1.0.2n. • Fixed being unable to load dictionary files larger than 16mb. • Fixed an issue where out of memory conditions would trigger a buffer overflow instead of a clean crash. • Word wrap is turned on by default for the console. • Added Regex Replace Widget.sublime-settings and Console Input Widget.sublime-settings.